Majestic concert snare drums are available with a variety of materials and sound qualities. 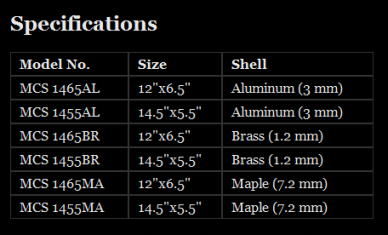 Depending on your personal preferences you can choose from the following kettle qualities available in 5.5” and 6.5” high: Maple 7.2mm, Aluminum 3mm and Brass 1.2mm. Aluminum and Brass shells also available in 3.5" high. All models have solid die-cast tension hoops and 10 tension lugs for optimal head tension. A single-handle smooth operation snare system is used with a 25-strand steel wire snares. Snare tension adjustment on left and right sides. Remo ® Renaissance™heads on batter and snare sides. A unique felt muffler is provided with every snare drum.